Redtrust Digital Signature allows you to sign legally compliant documents using digital certificates hosted on our servers. Clients can place a Signature Request for the user to digitally sign the documents, also the user can control and manage the status of the signatures. All of this under the industry-leading best practices for securing your data and complying with regulations. Want to know more about our Digital Signature? The Administrator can create a Signature Request for a user (e.g. requesting a signature for one or more documents). Users receive notifications of a signature request by email. 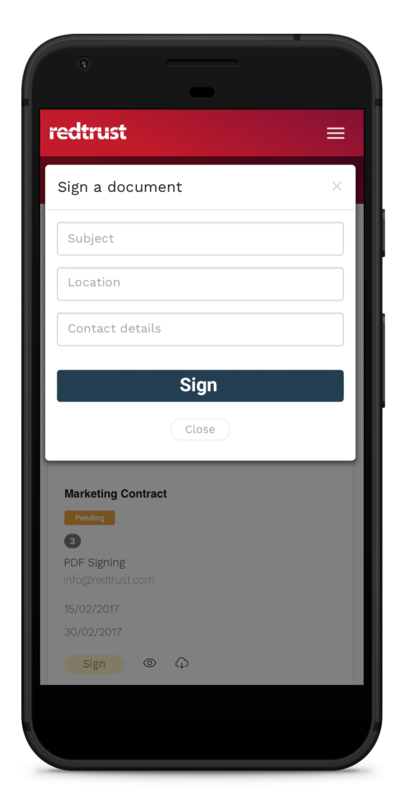 In order for a user to electronically sign a document, he or she needs appropriate permissions established in Redtrust’s administration console. The user will be able to see which documents he or she must sign, with which certificates and what the deadline is, and proceed to sign. Once signed, the document’s signature status update will appear.